March 12, 2018 - Erlanger, Kentucky - Butler Watch Company honors Mr. Russ Leighton as a "Pillar of Aviation." The honor comes with the presentation of a Butler Professional Series GMT watch. August 8, 2017 - Carmel, Calif. The newest watch from Butler Watch Company, the OOOI, was successfully funded on the crowdfunding website, Kickstarter. Written by Ben Sclair. July 29, 2017 - Victor Marks writes about the Butler OOOI watch's value when comparing to other watches using the same analog/digital movement, the ETA 988.333. Watch Freeks Review of Butler Professional Series J80. August 2, 2016 - Watch Freeks features a review of Butler Watch Company's J80. The review is written by Mark Andrews. Mr. Andrews took great photographs of the J80 in this review (at left). See them on the Watch Freeks site. June 16, 2016 - Tech Crunch (techcrunch.com) article features Butler Watch Company's J80 and iphone app, Time flies. The article is written by John Biggs. Sept 10, 2015 - Carmel, California - Butler Watch Company just released a mobile application called, Time Flies. It is a time and weather application suited for Aviation and Travel. The elegant display is based on the Buter Watch Company Professional Series GMT watch. June 9, 2015 - San Mateo, California- Butler Watch Company honors Richard "Butch" Pfeifer as a "Pillar of Aviation." The honor comes with the presentation of a Butler Professional Series GMT watch. December 29, 2014 - WWW - WristWatchReview.com features Professional Series GMT in an Article by Patrick Kansa: World Time On The Wrist With The Butler Professional Series GMT. November 18, 2014 - Wilmington, Ohio- Butler Watch Company honors Rex Gunning as a "Pillar of Aviation." The honor comes with the presentation of a Butler Professional Series J80 watch. July 31, 2014 - Carmel- Butler Watch Company is now offering personalized engraving for watch products purchased through the company website. Custom options are available. Visit the official Butler Watch Company website for samples, details, and pricing. July 2014 - HONG KONG - Butler Watch Company received a nice write up in Aplus Magazine July 2014 issue. This periodical includes a monthly column about watches. 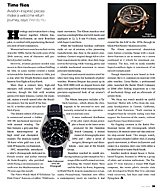 The July 2014 watch article content happened to feature pilot watches. July 11, 2014 OWATONNA, Minn. -- We were proud to see our Butler logo and name on John Klatt's MX-S airplane rudder as it left for the first airshow in full view. The Debut show was in Tarkio, MO at the "Wingnuts Flying Circus." Check Team Klatt's Airshow Schedule here. Jun. 5, 2014 - OWATONNA, Minn. -- John Klatt Airshows, Inc. is pleased to announce the selection of Butler Watch Company as "The Official Timepiece of John Klatt Airshows". All of the John Klatt Airshow team members are wearing our watches.